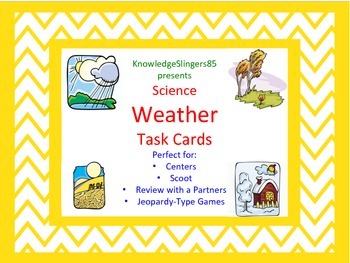 This set of 32 task cards is perfect to go along with your unit on weather. It can be used for students to work independently or with a partner. I have used the cards in centers, for review games with teams, or in a game of Scoot. 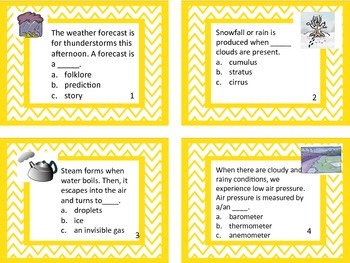 This set covers the essential academic weather vocabulary for elementary students. 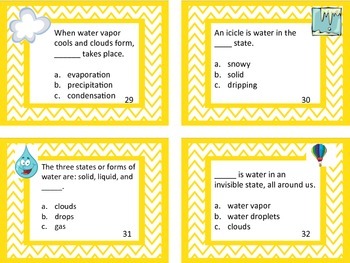 The concepts covered are: the steps of the water cycle; the three states of water; weather tools; types of clouds; and climates of regions.